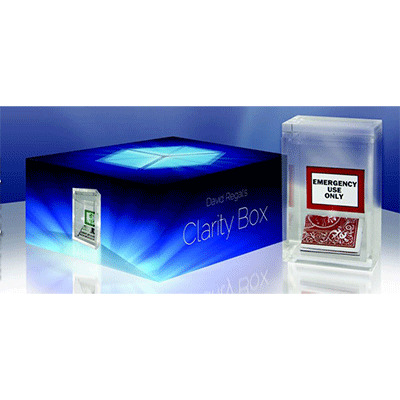 That, in essence, is The Clarity Box. The object need not be a card. It can be a signed bill, or a prediction - truly a utility prop. The quality of The Clarity Box is exquisite. Custom-fashioned from thick, sparkling acrylic, it has the look of a miniature museum showcase. I believe it to be one of those effects that you need to have in your repertoire when performing. It is an extremely clever upgrade from older card to canister effects. Pros: It is completely clear and you can see the card the entire time. customization! You don't have to use cards with this, you can use money as well. The con can be worked so you can minimize the potential of the spectator seeing something they shouldn't. for an amazing card to CLEAR canister, this product is well worth the 80 dollars. This fooled me so badly when I saw the trailer. So much so that I doubted that it would be as good as it look on film as in person. I ordered it on a trust basis (you guys haven't let me down before on what I've ordered from you). Sure enough, it look just as impossible, if not better in person and the options to use bills and other objects instead makes it all the better. I read some of the reviews and the main criticism was for it not being angle proof. This is true but the angles are easily covered and I have not had any problems with this an I must have used it at least 30 times already. Thank you for the quick shipping as well!